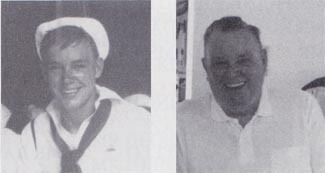 George O. Wymaster, Chief Petty Officer, born May 4, 1917, San Francisco, CA. He enlisted in the USN Feb. 10, 1936, and after 13 weeks in training at the recruit training station at San Diego, he reported aboard the USS West Virginia in May 1936. Assigned to the F (fire control) Div. and advanced to seaman 1/c. In 1938 he transferred to the Flag Div. (print shop) and advanced to printer 3/c and printer 2/c. Left the Wee Vee in July 1941 for new construction, the USS Fulton (AS-11), a submarine tender. Was aboard until 1945, then transferred to Washington, DC, to the National Security Agency and changed rate to SP(Q)CR cryptographer. He stayed with the agency until 1955 then retired as a chief petty officer.